Northbrook, IL, May 1, 2016 – Digital Check, following upon the successful release of its sixth-generation TellerScan TS500 check scanner, announces that the new device has been certified with Silver Bullet Technology Inc.’s industry-leading Ranger® API. Effective immediately, software partners using Ranger for scanner integration can begin testing the TS500 for check processing in teller capture, branch capture, and remote deposit environments. 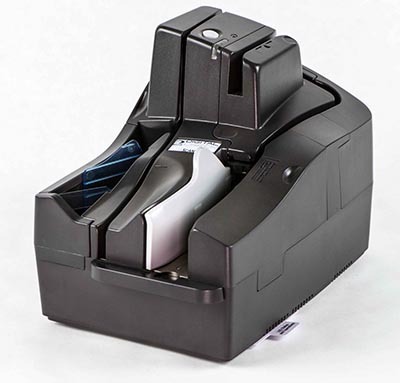 The TellerScan TS500 is Digital Check’s newest multi-feed, multi-function check scanner designed specifically for image capture at the teller window or the branch back counter. Its patented AccuTrac® check-alignment system helps it achieve maximum accuracy and image quality with less maintenance and downtime than other devices on the market. By including integrated features such as a 3-track magnetic stripe and ID card reader, it improves the user experience while saving space at a teller window. Its rated speed of more than 200 documents per minute provides industry-leading speed and performance, and also makes its low-cost and small footprint a viable option for back counter applications. “We’re excited that Silver Bullet, the premier API provider to the financial industry, has integrated and certified our TS500 with their Ranger product. This certification will make for a faster and simpler rollout process to their many leading integration partners and banking customers,” said Rick Ooten, Digital Check’s vice president of product development. For more information about the TellerScan TS500, visit www.digitalcheck.com. To learn more about Ranger, visit www.sbullet.com.